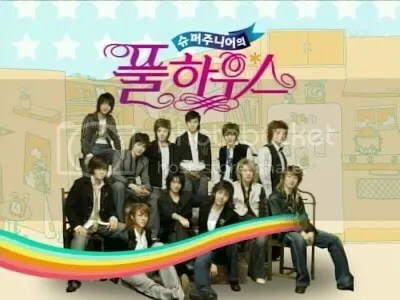 Super Junior starred in their own reality show called Super Junior Full House, which was about two transfer students who will be boarding with half of the members of Super Junior, specifically in the dorm where Heechul, Kangin, Kibum, Siwon, Hangeng, and Donghae were staying in. The two transfer students were model Eva and her friend Anya. The show ran for 13 episodes and it’s running time was about 25 minutes per episode. It was aired from May 27, 2006 until August 26, 2006. The home stay lasted for a month, and with the show it presented comedic experiences by Super Junior and the two international female students showing their deep friendship and funny attitudes and personalities. I’ve noticed that some of your SuJu videos were taken down. Is there any other way for me to download your videos? Could you perhaps upload to mediafire or other file-sharing websites? I am so sorry to burden you with this but you have the best quality videos and I cannot thank you enough because of your hardwork in organizing and helping other ELFs enjoy SuJu. I especially have a hard time looking for HQ SuJu Full House videos and HQ SuJu minidrama videos. Once again, if this is not possible, I apologise for troubling you. I am a long-time ELF for 5 years and I want to preserve SuJu’s memory before it gets wiped off the internet. Hello! ^^ Unfortunately, I don’t have any of the Super Junior videos saved on my computer, so I won’t be able to upload the videos to mediafire for others to download. 😦 I’m happy sharing SJ video links with other ELFs to enjoy as well ^^ but sadly due to copyright issues SJ subbed videos are frequently removed from sites and especially with older shows like SJ Full House and the mini drama, it’s really difficult to find HQ videos since people don’t upload them with good quality…so, I wasn’t able to find better quality videos. And don’t feel like you’re troubling me by asking me questions, I always love to help other ELFs when I can…and you asked me so nicely too, which made me felt really happy…I just wish I was able to be more helpful. Did the first lot of Dailymotion episodes get deleted?? I can’t download the videos from this link, do you have another link? You can watch the first 10 episodes of full house on vimeo. Just search “super junior full house” on their website. You can download them on vimeo too.